I was searching for this one for quite a while, so it seems like a good fit for the first birthday of the Psychedelic Garage. The cover art and the title is what got my attention. Art was an early version of Spooky Tooth, although I have to admit that I know pretty much next to nothing about that relatively renown band. Thus, I'm coming at this one with no particular expectations. 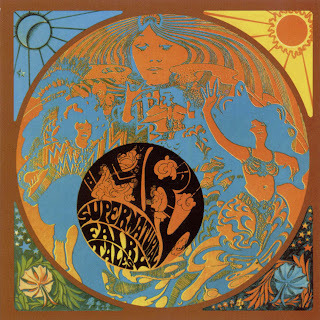 Supernatural Fairy Tales is what we might refer to as a slightly above average acid rock album. The title track could pretty much end up as a dictionary definition of that sub genre. The band is pretty tight and blends just the right amount of weirdness into their production. They didn't quite have that flash of inspiration that blows you away, but this is the perfect band for your late 60's film bar scene. For the most part, Art does best when they're rocking their balls off. The louder the track, the more immediate they are. Fortunately, this album has plenty of full-tilt psych rockers, often adorned with harpsichord, or backward cymbals, or some other tired and true but totally groovy production trick. "I Think I'm Going Weird," "Come On Up," "Brothers, Dads, And Mothers," and "Alive Not Dead" all win a few points using this criterea. That said, my favorite moment on this album veer somewhere else with the wild wall of percussion that we're presented with on "African Thing." They don't fare quite as well on their Buffalo Springfield cover. Art might have not had the pure talent to put out a total winner, but they had the drive to catch your attention. This is the rare UK garage punk album that has the meddle to compete with the Chocolate Watchband or the Electric Prunes. It's not what the British did best, but this psychedelic early heavy metal mesh is among the best that the British managed at the time. We Have Over 2500 Vintage Art and Music Posters! Check out our Wholesale section to save some dough or make some cash on ebay! Love, peace and vintage posters! Spooky Tooth was more hard rock than this. Their keyboard player was Gary "Dream Weaver" Wright. Ah, I can finally hear this! Darn hard to find! Thanks Doc !! Very interesting write up you gave there which made me want to listen to this....Im familiar with spooky tooth so this will be interesting to hear what they were up to in 67'....thanks for the share. I think you need to revaluate this album it may have to grow on you,but once it does grow on you after a few listens under each successful play new things get revealed that make you sit up,and say hey I need to change my reveiw of this record.It's a bonifide (true not a masterpiece),but a classic.